DOWN THE SPINE OF THE CAPE: In 1947, the Massachusetts Department of Public Works (MassDPW) announced plans for a "Mid-Cape Expressway" as part of its statewide expressway program. As originally planned, the expressway relocation for US 6 was to extend nearly 36 miles from the Sagamore Bridge east to Orleans. From Orleans east (and north) to Provincetown, grade separations were to be built at select intersections, though there were no immediate plans to convert this section to freeway. The initial MassDPW plans called for the construction of a four-lane, median-separated freeway from the Sagamore Bridge east to Barnstable, and a fully-access controlled "super 2" from Barnstable east to the terminus at the Orleans rotary, where US 6 joins MA 6A and MA 28. East of Barnstable, right-of-way was to be acquired and bridges were to be built early on to facilitate the building of an additional two-lane carriageway at a later date, bringing total capacity to four lanes. Proceeding easterly from the Cape Cod Canal, this highway will connect with the recently completed section of the Mid-Cape Highway between the Canal and Route 132 in Barnstable. 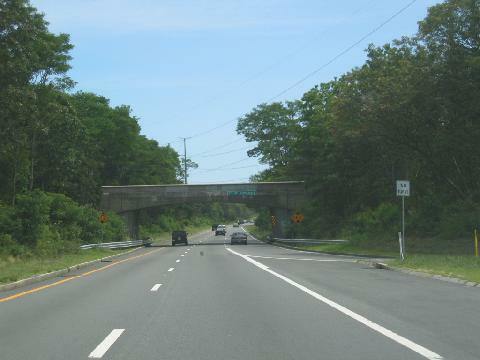 The further completion of the remaining gap on this highway (Route 6) can be anticipated within the next few years, thereby opening up wide avenues of highway travel to the Cape Cod vacation area from points to the south and west. The section from Barnstable to Dennis is to be placed under contract shortly. Sagamore Bridge approach in Sandwich to EXIT 6 (MA 132) in Barnstable: This section, which was built as a full four-lane freeway between 1950 and 1953, is noted for its concrete-arch frame and granite overpasses. The freeway originally ended at a "trumpet" interchange; US 6 was multiplexed temporarily with MA 132 and MA 28 beyond this point. EXIT 6 to EXIT 13 (Orleans rotary / eastern terminus): This section originally was built as a "super 2" between 1953 and 1959. A second carriageway was to be built to carry eastbound traffic, and bridges were built in advance (but only east to EXIT 9) to carry the eastbound lanes. Upon completion of the eastbound lanes, the existing two-lane section was to revert to westbound use only. The bridges along this section had a more utilitarian steel-beam design, in contrast to the concrete-arch frame and granite overpasses of the more westerly section. There was also an at-grade railroad crossing just west of EXIT 8 (Union Street) in Yarmouth. ADDING MORE CAPACITY FROM HYANNIS TO DENNIS: Between 1966 and 1971, the MassDPW upgraded the Mid-Cape Highway from EXIT 6 (MA 132) in Hyannis east to EXIT 9 in Dennis. Along with the construction of new eastbound lanes, the project featured an upgrade at EXIT 6 (including new bridges and configuration of the interchange as a partial cloverleaf), construction of new breakdown lanes, construction of new bridges over the railroad just west of EXIT 9 (to replace the at-grade crossing), and the opening of a new rest area just west of Dennis. CHANGES FOR INTERCHANGES: In the early 2000s, the state converted the existing partial cloverleaf interchange at EXIT 9 into a full cloverleaf at a cost of more than $3 million. As part of this project, the state also created a more gradual transition for the eastbound two lanes as the squeeze into one, and a more gradual widening of the westbound lane into two lanes. This eliminated the eastbound two-lane stub just east of EXIT 9 that resulted from the 1966-1971 expansion project. Around this time, the state also proposed construction of a new EXIT 6A (Mary Dunn Road) that would serve a nearby light industrial park on Independence Drive. Proponents suggest the new exit would ease congestion on nearby roadways, while serving as the linchpin for a proposed relocation of the Cape Cod Hospital campus. However, opponents fear the new interchange would spur the development of more intense industrial and "big-box" retail use. In 2008, the Hyannis Access Study Team organized by the state recommended holding off on construction of the $20 million project until at least 2015, when the team can evaluate more immediate measures designed to reduce congestion in Hyannis. WILL THE DENNIS-TO-ORLEANS "SUPER 2" EVER BE WIDENED? In 1969, the MassDPW began design and environmental studies on upgrading the remaining "super 2" section from EXIT 9 east to the Orleans rotary. These studies were abandoned in 1974 because of environmental and land use concerns. The widening project's potential effect on local drinking water supplies was of particular concern. To improve safety on this "super 2" section, the state reduced the speed limit from 55 MPH to 50 MPH in 1974. However, this failed to stem the rising accident rate, which was attributed to the increasing traffic on the Middle and Lower Cape. In the late 1980s, the state revisited the proposal to widen the 12.8-mile-long section of the Mid-Cape Highway east of Dennis after a 20-year period in which 36 people were killed in accidents on the "super-2" stretch, mostly in head-on accidents. The state's immediate response was to install a three-foot-wide berm and three-foot-high reflectors along the centerline, add shoulders, and prohibit all passing along the section. The $7 million improvement project was completed in 1991. In 1994, the now-rechristened Massachusetts Highway Department (MHD) unveiled three new alternatives, as well as a "no-build" alternative that simply extended the acceleration-deceleration lanes. ALTERNATIVE 1: This alternative would provide a "full-build," four-lane freeway from EXIT 9 east to EXIT 13 (Orleans rotary). Separating the two carriageways would be a variable grass median measuring between 14 feet and 60 feet wide. New bridges to carry the eastbound lanes of US 6 would be built at Depot Street and MA 137 in Harwich, and at MA 6A in Orleans. A new bridge also would be built for the Freemans Way overpass, and the existing bridge carrying MA 124 would be expanded to accommodate the new eastbound US 6. Existing interchange ramps would be modified, but the Orleans rotary would not be eliminated. Berms along the left and right shoulders would send stormwater runoff away from water recharge basins. The "full-build" alternative was estimated to cost $45 million. ALTERNATIVE 2: Same characteristics as alternative 1, but the improvements would end just east of EXIT 12 (MA 6A) in Orleans, at which point a "transition" area to "super-2" would be built. This alternative was estimated to cost $43 million. ALTERNATIVE 3: Same characteristics as alternative 1, but the improvements would end just east of EXIT 11 (MA 137) in Harwich, at which point a "transition" area to "super-2" would be built. This alternative was estimated to cost $26 million. All of the alternatives would include the construction of a new diamond interchange for EXIT 11A (Freemans Way) in Brewster, where there currently are two emergency ramps. The widening proposal has not advanced beyond the design stages. However, the MHD built two new bridges in the early 2000s to carry the Cape Cod Rail Trail over US 6 in Harwich and Orleans, with accommodation for a future second carriageway. THE MID-CAPE HIGHWAY TODAY: According to the Massachusetts Department of Transportation (MassDOT), the expressway carries approximately 55,000 vehicles per day (AADT), a figure that can double easily in the summer months. From the Cape Cod Canal east to EXIT 9 (MA 134), the four-lane Mid-Cape Highway has a 55 MPH speed limit (the speed limit was 60 MPH for a brief period from 1971 to 1973). The highway has a 50 MPH speed limit in the "super 2" section east of EXIT 9 in Dennis. A MORE AMBITIOUS PLAN: The 1953 "Cape Cod Expressway" plan made vague plans for extending the four-lane expressway east (and north) of Orleans to Provincetown. Since US 6 serves as the main street for Eastham, Wellfleet, Truro, and Provincetown, this proposal likely was abandoned in the early stages. However, grade-separation structures were built on remote stretches of two-lane US 6 away from downtowns, and a four-lane undivided section was built between North Truro and Provincetown. AN INTERSTATE FOR CAPE COD: Interstate 195 should be extended east along US 6 (Mid-Cape Highway) east to Orleans, pending improvements to modern highway safety standards. The extended I-195 would connect to the existing I-195 via MA 25, the Bourne Bridge, and the unbuilt Southside Connector. The immediate approach roads to the Sagamore Bridge, along with the existing Pilgrims Highway (MA 3), would be re-designated I-93. SOURCES: "New England Road Project Backed," The New York Times (10/29/1953); "New England South Shore Highway," Interstate Study Committee (1953); "The Massachusetts Highway Story (1949-1969)," Massachusetts Department of Public Works (1969); Proposed Route 25 and Route 28: Final Environmental Impact and Section 4(f) Statement, Federal Highway Administration and Massachusetts Department of Public Works (1977); "Alternatives Recommended for Analysis in the Environmental Impact Statement of US Route 6 on Cape Cod Between Dennis and Orleans," Massachusetts Department of Public Works (1986); "Route 6 Cape Cod: Draft Environmental Impact and 4(f) Statement," Massachusetts Highway Department (1994); "On Changes for Cape's 'Suicide Alley,' Opinions Diverge" by Jeff McLaughlin, The Boston Globe (1/15/1995); "Cape Cod 2000 Regional Transportation Plan: Executive Summary," Cape Cod Commission (2001); "Bicycle Trails on Cape Cod Are Pocked by Cracks, Potholes" by Beth Daley, The Boston Globe (7/17/2003); Becoming Cape Cod: Creating a Seaside Resort by James C. O'Connell, University Press of New England (2003); "The Coming of the Mid-Cape Highway" by Jack Sheedy, The Barnstable Patriot (7/16/2006); "Hold Off on Exit 6-1/2, Task Force Advises" by Jim Kinsella, Cape Cod Today (9/03/2008); Emi Melissa Briet; John Carr; Brian Connors; Dan Moraseski; Alexander Svirsky. US 6 and I-195 shields by Ralph Herman. Mid-Cape Highway exit list by Steve Anderson.